In the first 3 articles in this series, 1) WHY PRESIDENT OBAMA WAITED until APRIL 27, 2011 to RELEASE a FACSIMILE of his LONG FORM BIRTH CERTIFICATE; 2) WHY PRESIDENT OBAMA RELEASED the LONG-FORM IMAGE of his BIRTH CERTIFICATE in PDF versus JPEG; and 3) SHE SAID / HE SAID: SCRIPTING the 04.27.11 LAUNCH of PRESIDENT OBAMA’S LONG FORM BIRTH CERTIFICATE we distinguished between the public versus private aspects of the 2011 launch of President Obama’s long form birth certificate advertising campaign, including peeking at the roles played by the various actors identified as participating in the rollout, recognizing when these ‘officials’ wore their public (official) versus private hats. But our previous analysis didn’t do justice to either Loretta Fuddy, Director, HI Department of Health; or President Barack Obama, without whose complicity the campaign never could have pulled this off. In this 4th article in the series, we will examine this public/private dichotomy focusing on Ms. Fuddy (and her immediate predecessor at the HI DoH, Ms. Fukino), honing in on when the conduct of a public official is ‘officially’ part of the job. But even assuming the original version of Ms. Fuddy’s correspondence was ‘real’; did her statements therein constitute an official state proclamation of the President’s place of birth? For example, would her seal of approval posted on the internet per se mean to a court of law, for example, (or a state election official) he is who he says he is? Not hardly. One way to determine whether an utterance by someone holding public office is ‘official,’ is to examine whether the statement is made pursuant to an official function of the job. For example, do Hawaii Revised Statutes authorize the Director of the HI DoH to personally inspect the contents of vital documents of an identified individual contained in files that office is required to maintain? Do they authorize her to publicly pronounce her opinion as to the authenticity of the information contained in a personal record preserved in her care? The answer emphatically is, no. And you can get to this result in any number of ways, including these: find the law that specifically authorizes her to carry out the act; or, in the alternative, the law that prohibits it. 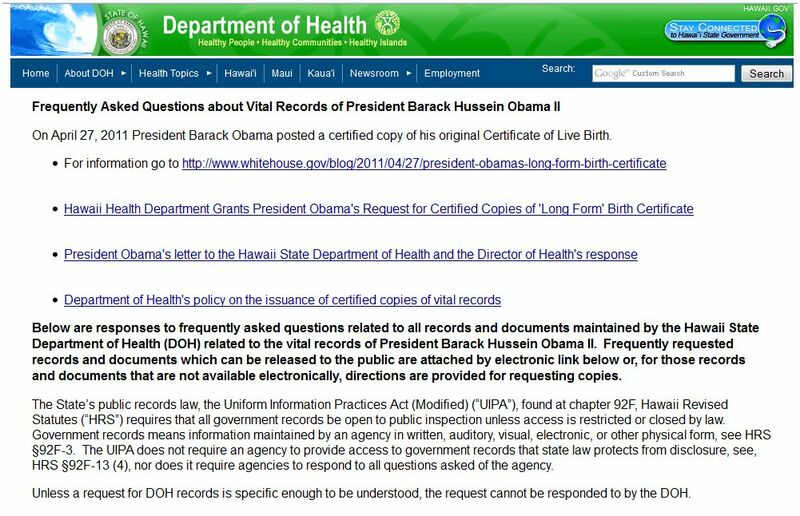 Yes, I linked to the HI DoH web site, to the section above and another entitled “About Vital Records.” All the information needed to establish that statements such as the ones attributed to Director Fuddy (and Fukino before her), mean absolutely nothing when it comes to confirming the facts of Mr. Obama’s place of birth, is right there in front of your eyes, like a neon sign flashing, FRAUD. Because even assuming those statements attributed to Ms. Fuddy were actually made by her; under HI law, only Mr. Obama, the supposed subject of those records, has the right to reveal those statements publicly. Ms. Fuddy not only isn’t authorized to make statements with respect to the accuracy of Obama’s personal records; but, she isn’t authorized to breach his privacy rights. And that’s probably why, if you look closely, you will see, she did not. Rather, Mr. Obama did. She only referenced his prior remarks. Did you catch that opening line? On April 27, 2011 President Barack Obama posted a copy of his original Certificate of Live Birth. But here’s the thing. While this code can be seen quite clearly on the HI DoH site; the same letter posted on WH.gov, which appears on the WH.gov server, shows a code so fuzzy it cannot be deciphered. Notwithstanding my general reluctance to speculate absent any evidence; I did think about the underlying rationale for this distinction, and came up with this. The Obama campaign provided the HI DoH with the PDF of Ms. Corley’s letter to be stored on the HI DoH site and linked directly back to their blog, so as to provide the documents posted on the HI DoH web site with the ‘appearance’ of official HI pronouncements on the subject. Then, at some point after these documents were sent to HI; I imagine someone on this end, that is, in D.C., figured the log code for Perkins Coie was too easily traced by, say, an over-zealous filing clerk or, even a hacker! So, on the WH.gov blog, they made sure to post an obliterated log code. But for some reason, the PDF which had already been uploaded onto the HI server, was not replaced. In addition to visual clarity, there is also this difference in those Corley letters: the PDF of that letter stored on the HI server, shows no hole-punch at the top, whereas the PDF stored on the WH server contains the 2-hole horizontal marks indicative of stored legal correspondence. I couldn’t help thinking, when the WH team determined to obliterate the legal code at the bottom; in an attempt to maintain the ruse that this was a legal letter from Corley to Fuddy, they copied the legal correspondence physically fastened in the file. In this way, it retained the ‘look’ of a real legal document which it was, part of the Obama 2012 campaign; while maintaining the element of untraceability. But if these facts don’t convince you that, except for certifying Obama posted statements attributed to the HI DoH with respect to his long form birth certificate, the HI DoH has certified nothing; just read the Disclaimer at the bottom of their web page! This WEB SITE is provided “AS IS” and without warranties of any kind. 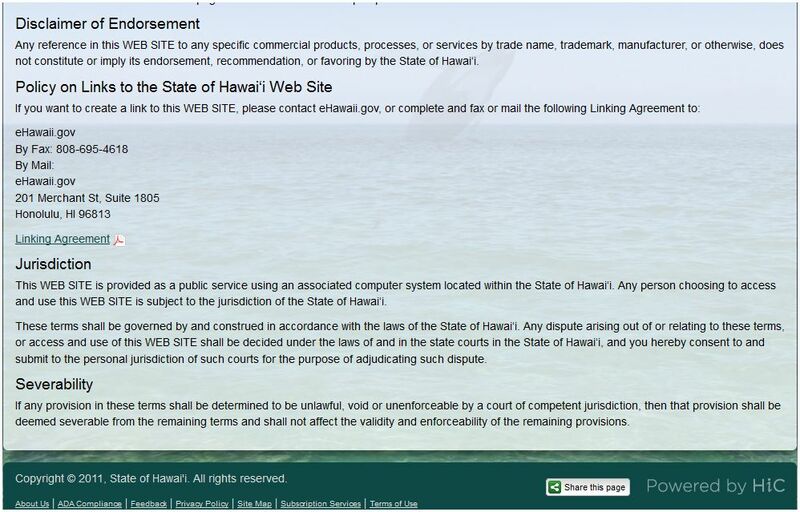 To the fullest extent of the law, the State of Hawai‘i, including each agency, officer, or employee of the State of Hawai‘i, disclaims all warranties, expressed or implied…with respect to this WEB SITE…In addition, neither the State of Hawai‘i nor any agency, officer, or employee of the State of Hawai‘i makes any representations, guarantees, or warranties as to: (1) the accuracy, completeness, currency, or suitability of the information provided via this WEB SITE; (2) the use of or the results of the use of this WEB SITE; and (3) the accuracy, reliability, availability or completeness or usefulness of the content of web sites created and maintained by persons other than the State of Hawai‘i and linked to or from this WEB SITE. 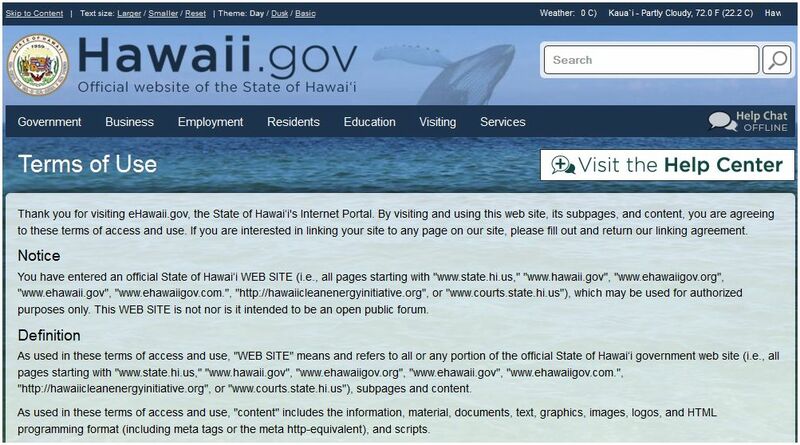 In sum, just because something is posted or linked to on the HI DoH.gov web site does not mean, it is the truth. And now, a note about Ms. Fuddy’s immediate predecessor, Ms. Fukino. The present HI DoH web site also contains 2 links to “all past statements by the Health Director.” Both of these links lead to statements made by Ms. Fukino. Here is the statement she made in October 2008. In other words, she is assuming all legal liability for ‘talking out of school,’ that is, making a public statement about Mr. Obama’s records not otherwise allowed by law. So, why would she put herself in what might appear on its face to be a legally untenable position? Who knows. Paraphrasing the words attributed to her successor, maybe it’s because “inquiries [to the HI DoH for Obama’s birth documents] have been disruptive to staff operations and have strained State resources.” Or maybe it’s because, the only person with standing to contest her apparent breach of privacy is the subject of the record, Barack Obama. And, surely, he is not about to attack the proverbial goose that laid the golden egg, least of all one month before the 2008 general election. 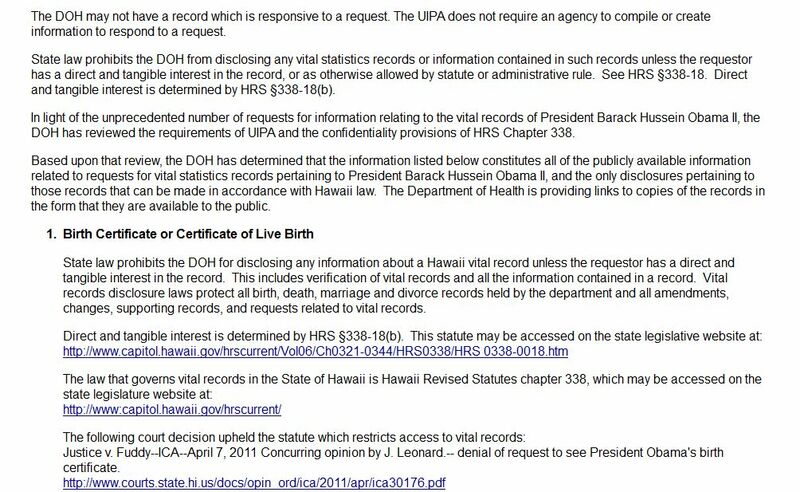 This is third in the series of articles addressing the legal nature of that long form birth certificate purporting to establish President Barack Obama’s Hawaiian birth, released on April 27, 2011 in the form of both electronic images which were posted on the WhiteHouse.gov blog and, hard copies (of those same images) which were distributed to reporters. (This is all spelled out in the first 2 articles in the series, WHY PRESIDENT OBAMA WAITED until APRIL 27, 2011 to RELEASE a FACSIMILE of his LONG FORM BIRTH CERTIFICATE and WHY PRESIDENT OBAMA RELEASED the LONG-FORM IMAGE of his BIRTH CERTIFICATE in PDF versus JPEG, which are meant to be read before tackling the present post,) But the article I originally had in mind to follow these 2 required re-thinking when I received an email from azgo suggesting that “by reading the ‘jbjd’ blog, [the Obama campaign] devised the [long-form birth certificate] scheme to make it look like the image came directly from HI; per our conversations [on this blog] about how state election officials should receive birth records directly from the state in which the candidate was born.” That got me to thinking. So, I looked for any articles referencing the distinction between a real identification document and a fake; which were posted here on “jbjd” before the 2012 re-election campaign launch in April 2011. On January 3, 2011, I posted DE-CODER RINGS (1 of 2), which confirms that under the U.S. Code, images such as Barack Obama’s COLB appearing on his web site “Fight the Smears,” satisfy the expenditure disclosure requirements of an electronic political advertising campaign. Here is an excerpt from that post. Here is just a partial index for TITLE 2 > CHAPTER 14 > SUBCHAPTER I, dealing with federal campaign funds. This was followed on January 12 by DE-CODER RINGS (2 of 2), which discussed the criminal implications of producing and distributing electronic images, such as that COLB, on campaign sites; but pretending, these are ‘the real thing.’ Here is a snippet from that article. But to answer the question concerning the legality of the FTS COLB under the U.S. Code, we will be concentrating primarily on section 1028. (B) the means of identification, identification document, false identification document, or document-making implement is transported in the mail in the course of the production, transfer, possession, or use prohibited by this section. (B) to make or obtain control of with intent to so transport, transfer, or otherwise dispose of. (f) Attempt and Conspiracy.— Any person who attempts or conspires to commit any offense under this section shall be subject to the same penalties as those prescribed for the offense, the commission of which was the object of the attempt or conspiracy. 5. NO MECHANISM INTENDED TO ESTABLISH ONLY ELIGIBLE CANDIDATES WILL BE ELECTED PRESIDENT WILL SUCCEED, WHICH RELIES ON CANDIDATE SELF-AUTHENTICATION. This has always seemed to me to be self-explanatory. In other words, stop asking Obama or anyone acting on his behalf but not in an official capacity; to get the man to produce anything! And do not under any circumstances accept as true, any document or facsimile any of these representatives not acting as the “issuing authority” introduces and claims is real! Apparently, the usual “jbjd” readers hoping to hone their civics educations were not the only ones listening. Attending the early morning press gaggle were Carney; WH Communications Director Dan Pfeiffer; and WH Counsel Bob Bauer. First, a note about Mr. Bauer, who would leave that job in June 2011, 1 month after the long form launch. President Barack Obama’s top lawyer at the White House, Bob Bauer, is quitting to return to his political law practice and represent Obama as his personal attorney and counsel to his re-election campaign….Bauer, a specialist in campaign finance, election law and ethics, is returning to the role as campaign counsel that he held when Obama ran for the presidency in 2008…. Bauer has been part of Obama’s circle since Obama was a freshman senator in Washington. He has long been a go-to lawyer for Democrats and is married to Anita Dunn, a Democratic operative who formerly served as Obama’s communications director…. He will also serve as counsel to the Democratic National Committee. And this, from Perkins Coie. Bob returned to the firm after a period of service to President Barack Obama as his White House Counsel from December of 2009 until June of 2011. He is now General Counsel to the President’s re-election committee, to Obama for America, and General Counsel to the Democratic National Committee. In 2008 (the copyright date in the in the footer of FTS is 2007), in response to media inquiries, the President’s campaign (in June 2008, U.S. Senator Barack Obama was only the D Party Presidential nominee wannabe; and the image posted on his FTS web site, which was clearly marked “PAID FOR BY BARACK OBAMA, per campaign expenditure laws) requested his birth certificate from the state of Hawaii. We (the nominee’s campaign) received that document; we (the campaign) posted it on the website (FTS). That document was then inspected by independent fact checkers (lay staffers employed by Annenberg Political Fact Check), who came to the campaign headquarters and inspected the document — independent fact checkers did, and declared that it was proof positive that the President was born in Hawaii. Q When you posted this did you post the other side of it where the signature is? Q Because it is not here and that’s been an issue. MR. PFEIFFER: We posted both sides and when it was looked at it was looked at by — the fact checkers came to headquarters and actually examined the document we had. That settled the issue. In recent weeks, the issue has risen again as some folks have begun raising a question about the original — about the long-form birth certificate you now have in front of you. And Bob will explain why — the extraordinary steps we (the President’s 2012 re-election campaign) had to take to receive that and the legal restraints that are in place there. And now I’ll have Bob explain that, and then we’ll take your questions. MR. CARNEY: I just want to — sorry, I meant to mention at the top, as some of you may have seen, the President will be coming to the briefing room at 9:45 a.m., making a brief statement about this — not taking questions, but just wanted to let you know. MR. PFEIFFER: And he will use this as an opportunity to make a larger point about what this debate says about our politics. And by Thursday of last week, I spoke to private counsel to the President and asked her to contact the State Department of Health and to have a conversation about any requirements, further requirements, that they thought we (meaning, anyone associated with this ploy) had to satisfy to lodge that waiver request (and simultaneously avoid breaking the law). She had that conversation with the state Department of Health on Thursday — counsel in question is Judy Corley at the law firm of Perkins Coie, (the law firm in which I was a partner before coming here and to which I will return shortly) and you have a copy of the letter she subsequently sent to the department with the President’s written request. The department outlined the requirements for the President to make this request. He signed a letter making that request on Friday afternoon upon returning from the West Coast. And private counsel (presumably, he mean Ms. Corley) forwarded his written request — written, signed request — along with a letter from counsel (okay, I give up, I have no idea whom he means here), to the state Department of Health on Friday. Let me emphasize again, there is a specific statute that governs access to and inspection of vital records in the state of Hawaii (as there is in every state)**. The birth certificate that we posted online is, in fact, and always has been, and remains, the (facsimile of a) legal birth certificate of the President (or anyone else) that would be used for all legal purposes that any resident of Hawaii would want to use a birth certificate for (and which could be used for that purpose if appropriately presented, for example, if displaying the official seal or, unaltered in any way). However, there is legal authority in the department to make exceptions to the general policy on not releasing the long-form birth certificate. The policy in question, by the way, on non-release has been in effect since the mid-1980s, I understand. So while I cannot tell you what the entire history of exceptions has been, (for effect, I will nonetheless speculate) it is a limited one. This is one of very few that I understand have been granted for the reasons set out in private counsel’s letter (id.). MR. PFEIFFER: We’ll be happy to take some questions. Q I guess I just want to make sure that we’re clear on this. Even though this one says “certificate of live birth” on here, this is different than the other certificate of live birth that we’ve seen? MR. PFEIFFER: Yes. The second page there is the one that was posted on the Internet. MR. PFEIFFER: And that is a copy of the one that has been kept at the Hawaii Department of Health. Q Okay. And this is the one that would be referred to — that people have been asking for that is the birth certificate? MR. PFEIFFER: They are both — the second one is the birth certificate. The one on the top is what is referred to as the long-form birth certificate. As you can see — and Bob can walk you through it (again, doesn’t take a lawyer to explain this obvious difference between a certificate and a certification but it does add an official imprimatur to the ruse) — it contains some additional information that is not on the second page, which was the birth certificate which was released during the campaign. If you could just explain the difference. MR. BAUER: There’s a difference between a certificate and a certification. The certification is simply a verification of certain information that’s in the original birth certificate. The birth certificate, as you can see, has signatures at the bottom from the attending physician, the local registrar, who essentially oversees the maintenance of the records. It contains some additional information also — that is to say, the original birth certificate — it contains some additional information like the ages of the parents, birthplaces, residence, street address, the name of the hospital. The core information that’s required for legal purposes and that is put into the actual certification that’s a computer-generated document, which we (the members of then U.S. Senator Barack Obama’s 2008 Presidential preference primary campaign) posted in 2008, that information is abstracted, if you will, from the original birth certificate, put into the computerized short-form certification, and made available to Hawaiian residents at their request. So the long form, which is a certificate, has more information, but the short form has the information that’s legally sufficient for all the relevant purposes. Q This first one has never been released publicly, correct? MR. BAUER: That’s correct. It is in a bound volume in the records at the state Department of Health in Hawaii. Q Bob, can you explain why President Obama let this drag on for four years? Was it Donald Trump that prompted you to issue this? I don’t think this dragged on for four years because this was a resolved — for those of you who remember the campaign, this issue was resolved in 2008. And it has not been an issue, none of you have asked about it, called about it, reported on it until the last few weeks. And as I said earlier, it probably would have been — a lot of the pundits out there have talked about the fact that this whole birther debate has been really bad for the Republican Party and would probably be good for the President politically. But despite that, the President, as I said, was struck by how this was crowding out the debate, particularly around the budget, on important issues, and was an example of the sort of sideshows that our politics focuses on instead of the real challenges that we have to confront as a country. And so that’s why he made this decision now, because it became an issue that transcended sort of this — it essentially was something that was talked about, as I said, from the nether regions of the Internet onto mainstream network newscasts. In fact, Jay has been asked about this just yesterday in this room. Q So I guess the implication is that you did get political advantage by having not released this until today, over the course of the last four years? Q When you say that, you mean certification — you released the certification? MR. PFEIFFER: When any Hawaiian wants — requests their birth certificate because they want to get a driver’s license, they want to get a passport, they do exactly what the President did in 2008. And that’s what that is. And we released that. And that’s what any Hawaiian would do to release their birth certificate. And that was good enough for everyone until very recently this became a question again. And so the President made this decision. He’ll talk to you more about his thinking on that. Q Will the President be holding it? MR. PFEIFFER: He will not, and I will not leave it here for him to do so. But it will — the State Department of Health in Hawaii will obviously attest that that is a — what they have on file. As Bob said, it’s in a book in Hawaii. Q But do you understand that this could quiet the conspiracy theorists? MR. PFEIFFER: There will always be some selection of people who will believe something, and that’s not the issue. The issue is that this is not a discussion that is just happening among conspiracy theorists. It’s happening here in this room; it’s happening on all of the networks. And it’s something that, as I said, every major political figure of both parties who’s actually out trying to talk about real issues is asked about this by the media. And so the President decided to release this. And I’ll leave it to others to decide whether there’s still — there will be some who still have a different — have a conspiracy about this. MR. PFEIFFER: Yes. I showed you one. Just one. Q You showed us a photocopy of one. MR. PFEIFFER: It has a seal on it. Q Why does this rise to the level of a presidential statement? MR. PFEIFFER: The President — this in itself — when you hear the President I think you’ll understand the point he’s making. That will be in not too long. MR. PFEIFFER: Let’s be very clear. You were there for the campaign. There was never a question about the original birth certificate during the campaign. It was a settled issue. (HA HA HA HA HA) I was there (in 2007) for the original decision to release the birth certificate (if we couldn’t steal the primary before people began asking questions about the candidate’s Constitutional eligibility for office). I was there (in June 2008) when we posted it online (because questions about his eligibility threatened to kill his chances at the nomination). I’m not sure I even knew there was an original one that was different than the one we posted online because it wasn’t an issue. (Liar liar, pants on fire.) So it wasn’t like — let’s be very clear. We were asked for the President’s birth certificate in 2008; we released the President’s birth certificate; and it was done. That was it. And so there hasn’t been a discussion about this other document for years. It’s only been in the last few weeks. And so to your second question, the President decided to do this and he’ll talk about this when he gets here — decided to do it at the timeline that Bob (Bauer, the campaign law expert and WH Counsel) laid out (so as to protect everyone involved in this farce from criminal liability) because it was a — this was a sideshow that was distracting from the real challenges that we’re facing. It’s not just a sideshow for him; it’s a sideshow for our entire politics (meaning, our re-election campaign) that have become focused on this. Q Not to give Donald Trump more publicity than he has, but is he the person who sort of — sort of that bridge between what you’re calling a fringe and the mainstream? Do you think that he’s the reason why this tripped the switch to a level where you now have to deal with something you thought was dealt with? MR. PFEIFFER: It’s not for me to say why mainstream media organizations began to cover this debate. They’ll have to answer that for themselves. …Q Dan, was there a debate about whether or not this deserved being discussed by the White House, whether or not — and I’m going back to the birth certificate. I lose points, I understand. But was there debate about whether or not this was worthy of the White House? MR. PFEIFFER: The point I’d make is that we weren’t the ones who — we’re not the first ones to bring this up in this room. Jay has been asked questions about this; the President has been asked about it in media interviews. And so that wasn’t a decision that we made, and the President made the decision to do this and he made the decision to — and when he comes down here this morning he’ll talk to you about why he thinks there’s an important point to be made here. MR. CARNEY: I will let the President speak for himself, but what Dan was saying and I think is important is that the issue here is that the President feels that this was bad for the country; that it’s not healthy for our political debate, when we have so many important issues that Americans care about, that affect their lives, to be drawn into sideshows about fallacies that have been disproven with the full weight of a legal document for several years. So, again, as Dan said, and a lot of political pundits have said, you could say that it would be good politics, smart politics, for the President to let this play out. He cares more about what’s good for the country. He wants the debate on the issues. He wants the focus on the issues that Americans care about. MR. CARNEY: Well, as Dan said, again, it has been a settled issue. MR. PFEIFFER: From a factual point of view, it’s absolutely a settled issue. But the fact that it was a settled issue did not keep it from becoming a major part of the political discussion in this town for the last several weeks here. So there’s absolutely no question that what the President released in 2008 was his birth certificate and answered that question, and many of your organizations have done excellent reporting which proved that to be the case. But it continued; the President thought it was a sideshow and chose to take this step today for the reasons Bob laid out. Q Aside from the policy distractions that was presented, did you have some concern because it was sort of reaching back into the mainstream news coverage that this could become a factor in the 2012 election with centrist voters? MR. PFEIFFER: This is the — the letter first and the two certified copies — this is one of those. This is the same thing you have a copy of as the first page of your packet. Q How did it get here? MR. PFEIFFER: As Bob said, it arrived by plane — the President’s personal counsel went to Hawaii and brought it back and we got it last night. MR. PFEIFFER: Between 4:00 p.m. and 5:00 p.m.
Q When did you decide to do this gaggle? Q When was this gaggle put on — when was this planned? Q Are these letters supposed to demonstrate the legal steps that were involved in releasing it to the White House counsel? MR. BAUER: The letters that you have, the personal request from the President, along with the accompanying letter from private counsel, is merely meant to document the legal path to getting the waiver of that policy so we could get the long-form certificate (as opposed to documenting an actual path undertaken to obtain a bona fide waiver from Director Fuddy on the date in the letter, resulting in her office’s production of a facsimile of a record on file with her office, evidencing Barack Obama was born in HI). 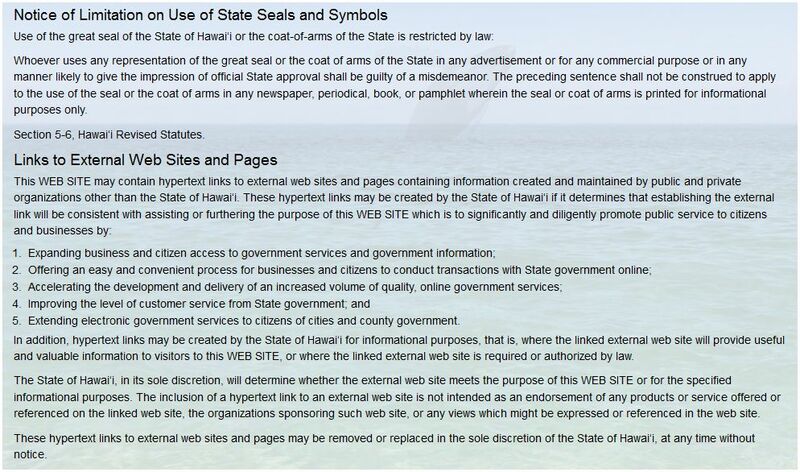 Q The waiver of Hawaii state government policy? MR. BAUER: Right. The non-release of the long-form certificate, which has been in effect since the 1980s — a natural question would have been, well, what did you do to obtain the waiver, and those letters represent the request. Q Well, isn’t it true that anybody who was born in Hawaii can write this letter? (Yes; of course.) I mean, that’s all there is to the waiver process? MR. BAUER: No. Let me just explain once again because I also noticed, by the way, in one report already the wrong certificate was actually posted on the website. The certificate with the signatures at the bottom — and that’s a key difference between the short form and the long form — the long form has signatures at the bottom from the attending physician, the local registrar, and the mother, is the original birth certificate, which sits in a bound volume in the State Department of Health. The short from is a computerized abstract, and that’s the legal birth certificate we requested in 2008 and that Hawaiians are entitled to. Since the mid-1980s, the State Department of Health, for administrative reasons, only provides to people who request their birth certificate the short form. They do not provide the long form. So in order for us to obtain the long form, we had to have a waiver (which, as you astutely pointed out, only required writing the letter requesting that waiver). We had to actually determine that there was a legal basis for providing it, and then ask them to exercise their authority to provide us with the long form. The steps required to accomplish that were a letter from the person with the direct and vital interest — the President — so you have a letter from the President (with no file reference code for document processing, archiving, or retrieval) , and then there was an accompanying letter from counsel basically formalizing the request. (I cannot figure out the angle on that one. Obviously, unless the President, here, the Requestor of the Record, has been adjudged to be mentally incompetent and placed under the guardianship of Attorney Corley, he doesn’t need her to ‘formalize’ anything! Maybe Bauer is still trying to fool reporters into believing getting the waiver so as to obtain a certified copy of a long form birth certificate is a big deal. Ideas?) So the reason we included that is that those were legal steps we took to obtain the long form by way of this waiver. MR. BAUER: It’s in the packet. Q And you went to Hawaii? 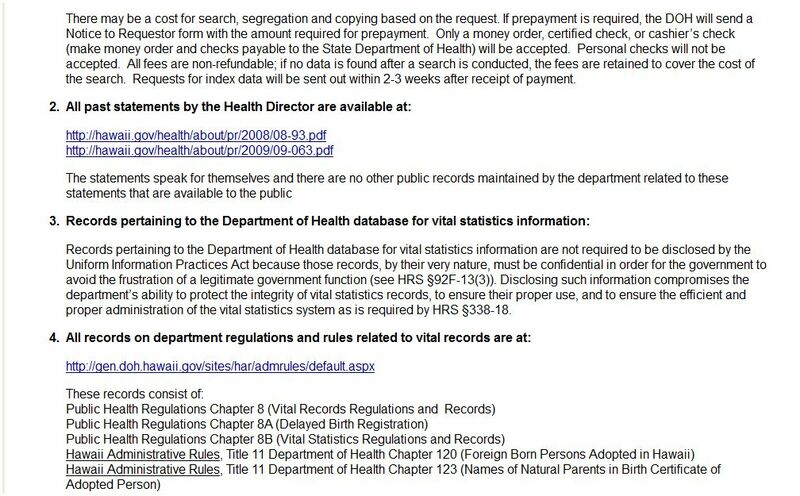 ** According to the web site of the HI DoH, here’s how to request certified copies of vital information. On the other hand, maybe all you want is a letter. Letters of verification may be issued in lieu of certified copies (HRS §338-14.3). This document verifies the existence of a birth/death/civil union/marriage/divorce certificate on file with the Department of Health and any other information that the applicant provides to be verified relating to the vital event. (For example, that a certain named individual was born on a certain date at a certain place.) The verification process will not, however, disclose information about the vital event contained within the certificate that is unknown to and not provided by the applicant in the request. Letters of verification are requested in similar fashion and using the same request forms as for certified copies. The fee for a letter of verification is $5 per letter. Either way, you can download an application form directly from the site. Thus, summing up these first 3 articles in the series, by clearly identifying both orally and in writing, the ‘birth’ documents distributed at the press gaggle and displayed on the WhiteHouse.gov blog are part of the “campaign”; by explicitly stating no public funds were expended in obtaining these documents; by making sure that any ‘official (looking)’ seal from the HI DoH did not appear on copies of documents distributed to the public; by distributing the documents to the public but not to a government official under the guise, this was a bona fide representation of the ‘facts’ contained therein; and by separating the campaign function from the traditional function of the Executive branch; and by transporting the false document via airplane instead of the U.S. mail; President Obama’s team likely skirted criminal violations of both campaign expenditure and public records laws. For my next few articles, I will focus on the elusive nature of paid political advertising campaigns. First, a riddle. Why did President Obama wait until April 27, 2011 to release a facsimile of his long form birth certificate indicating he was born in Hawaii? As you will see, the answer to each of these questions – why release and why release now – depends on whom you ask. Team Obama thought the “birther issue” was politically advantageous for them. By refusing to release the document, they gave the conspiracy theory just enough oxygen to keep it alive and make Republicans look crazy when asked about it by their constituents (obviously, the most die-hard “birthers” will summarily call the “long-form” certificate a forgery or find other excuses to keep their fevered dreams alive). Why Did Obama Wait Until Today to Release His Long-Form Birth Certificate? The move came as a surprise to the press corps, many of whom had not shown up for Wednesday’s early-morning White House briefing. By the time word had spread that Obama would be making a 9:45 a.m. statement on the matter, however, the top anchors at all the networks had scurried into the briefing room. 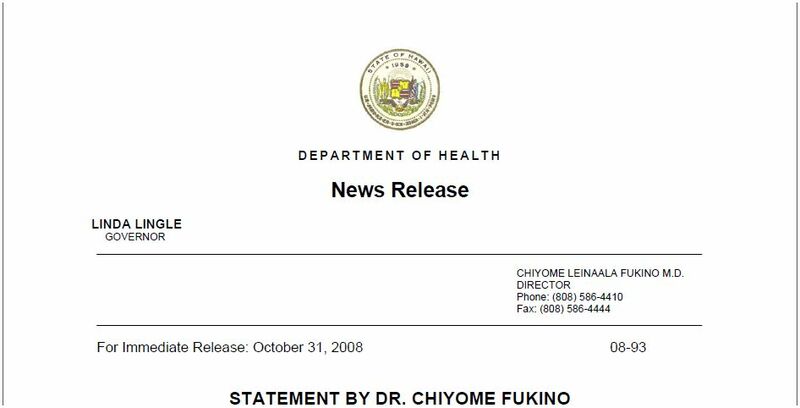 Last Friday, the president himself wrote Loretta J. Fuddy, the director of health at the State of Hawaii, requesting “two certified copies of my original certificate of live birth.” Fuddy complied. Shortly thereafter, the president’s counsel, Judith Corley of the firm Perkins Coie, flew to Hawaii to pick up two copies of the form. The trip was not taxpayer funded but, rather, paid out of the president’s personal account. Corley returned on Tuesday at roughly 4 p.m. with the copies. The White House announced a “morning gaggle” for reporters shortly thereafter. One aide explained that they did not want to “hold” on to the documents for release on a later date. Many members of the press confessed to being “stunned” as it became clear what was about to be discussed. White House press assistants handed out a six-page stapled packet of photocopies showing the new and old birth certificates as well as the White House’s legal correspondence with Hawaii’s Department of Health. Reporting from Washington — The White House released President Obama’s long-form birth certificate to reporters on Wednesday, an extraordinary step in reaction to renewed questions from critics about whether he was born in Hawaii. Amid questions during Obama’s 2008 run for the White House, his campaign released a certificate of live birth to verify he was a native-born citizen, a constitutional requirement of the office. (No; the Constitutional requirement is “natural born citizen”; and he released a “Certification,” not a certificate. It said so right on the mock-up.) So-called “birther” critics called the document insufficient, however, and conspiracy theories about the president’s birth have continued. Administration officials said they felt compelled to release additional documentation because the continued “distraction” was harmful for the country. “It may have been good politics and good TV, but it was bad for the American people and distracting from the many challenges we face as a country,” Dan Pfeiffer, White House communications director, wrote on the White House’s blog. So, what is my answer to the riddle, why did President Obama wait until April 27, 2011 to release a facsimile of his long form birth certificate? Because both the purported request to HI officials for his long form birth certificate; and the release of that facsimile of his long form birth certificate were part of his 2012 political campaign. (That’s why Stein’s article included the disclaimer, “The trip [to HI to ‘retrieve’ those documents] was not taxpayer funded but, rather, paid out of the president’s personal account.”) And even though questions still “swirled” since he was inaugurated in 2009, that he was Constitutionally ineligible to be President; he couldn’t launch another paid political advertising campaign to counter those concerns until he was actually in another political campaign; and he only launched his 2012 re-election campaign on April 4. Two years ago, back in March 2009, I posted this remark at the opening of a Reply to a Comment left on this blog by David A: “Welcome to the site that both supports critical thinking and offers answers to questions you might not want to hear.” March 24, 2009 at 01:42 Judging just by the information printed on “jbjd” since that time, I would say, it is a good thing I have not allowed the constant onslaught of personalized criticism to silence my work ever since. As you will see from the following exchange, not everyone would agree with me. FL is not an applicable state for a citizen complaint of election fraud based on the fact pattern, officials of the D party Certified to state election officials candidate Obama was qualified for office notwithstanding no documentary evidence available in the public record evidences he is Constitutionally eligible for the job. Because FL has no law requiring candidates must be qualified for the job to get the state to print their names on the ballot. Consequently, in the absence of such ballot eligibility laws, loyal “jbjd” reader Rlqretired, from FL, has lobbied legislators in that state to adopt such laws. In the past, he has used various arguments to sway these elected officials, which are spelled out on this blog and others. However, each time he asked me to review his correspondence, I rejected as frivolous his attempts in these petitions to link whether Obama is Constitutionally eligible for office; to the ‘illegitimacy’ of the on-line COLB based on an examination of its physical attributes (notwithstanding he maintains such analysis is a useful tool in his lobbying efforts). Recently, he composed this lengthy Comment, apparently intending, once and for all, to put to rest my objections to continued focus on the physical characteristics of that FTS COLB in any campaign the stated goal of which is to pinpoint documentary evidence establishing whether Obama is Constitutionally eligibile for office. jbjd – I think the reason you and I don’t see the value of the visual photographic truth that the Hawaiian State Seal placed upon the online birth certificate candidate Obama placed on the Internet is fake is because our goals are different. Your efforts deal with a bunch of lawyers and your goal, as I understand it, has been to get the AG’s in those states that already have statutes requiring independent eligibility certification to investigate the person that signed their state level certification without having adequate proof available to them to make such certification. If they did so, as I understand it, it would be an alleged crime based upon your hard work. Florida has no statute requiring independent verification by the political parties and depends strictly upon nominee certification by the political parties to be correct. My, goal for a year now, has been to convenience the Florida Legislature to pass a statute requiring an independent state level certification and the submission of the documents used to make that certification. At the general public level, as well as many in the Florida Legislature, I am dealing with average citizens who do not understand legalese nor will they take the time to study the issue for themselves. 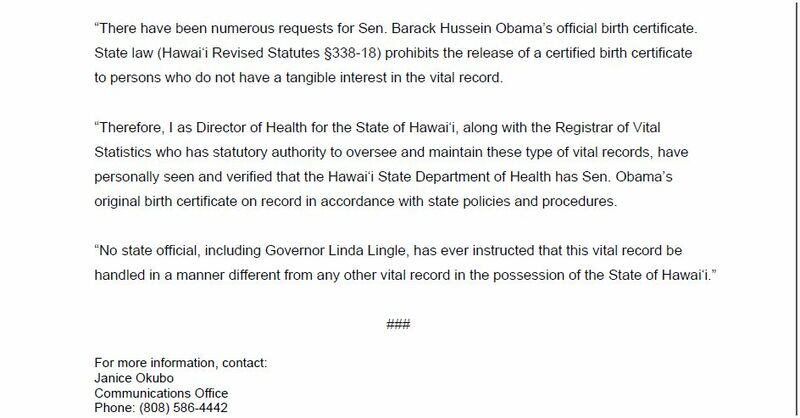 Willful ignorance abounds and this is where the photographic evidence that the Hawaiian State Seal placed upon Obama’s birth certificate is an irrefutable fake, is absolutely essential. These photo’s my not convince them to snap completely out of their willful ignorant bliss but it does blow away their argument that the online image of the Obama’s COLB could be a real copy of a real birth certificate and just transferred over into the advertisement in which it is located. Basically, that is what most people in our state and national governments still believe even today. I can easily accept and understand your point of view and I really wish you could see mine. For your information, the photographic evidence has, at my level and with some legislators, has been very effective and taken them to your web site for additional study. If I did not make it clear to you in my previous comment above, that the statute I was referring to was Hawaiian Statute 338-18 (g), I certainly apologize as I mistakenly assumed you had received and read my off blog email of 2/8 in which I stated; “My question deals with the authority the Criminal Justice Subcommittee the Florida House has under the Hawaiian Statute 338-18 (g). It appears to this country boy Florida Cracker that it does (apply), possibly on several counts……Your legal opinion of 338-18 (g) in this regard will be greatly appreciated. You have previously made clear that you have debunked the claim made by another blog that (g) of this statute can be used to the advantage of a lawyer in a criminal case to obtain verification relative to their lawsuits. However, it appears to this layman that under the circumstances I laid out in my previous comment, an authorized legislative committee assigned to investigate the authenticity of the only proof Obama has ever provided that he is even a citizen or either the Department of State whose director is the Chief Election Officer of the State and responsible for reporting possible fraudulent election activities would very likely qualify to receive verification of certain information displayed on the online image or the hard copy FTS made available to FC for examination and taking photographs of the Hawaiian State Seal. If either of these folks are eligible to obtain verification I can think of a dozen or so questions that I believe will produce answers that will not only be helpful to me in my goals but would help you in your goals as well. I look forward to your opinion of (g) and I surely hope you can tolerate me and my differing view on that one item. Before I had completed my reply to this ‘first’ Comment, Rlqretired submitted another lengthy Comment, more caustic than the first. I will print that second Comment as well. But first, here is the response I was in the process of perfecting to his ‘first’ comment. rlqretired: What a great comment. Now, I understand that my remarks about the work of ‘misstickly,’ whom you reference in your correspondence to state officials, mistakenly gave you the impression, I rejected focusing on that COLB qua image only because this took time away from my preferred focus, which is redressing past illegal conduct viz a viz the ballot. I thought I had stated quite succinctly in my last email to you that, my real objection is this. There. See what I mean? bob: There’s a line in that law you cite which reads in part, “The department shall not issue a verification in lieu of a certified copy of any such record, or any part thereof, unless it is satisfied that the applicant requesting a verification is:…” I can envision that, unless those Republicans paralegalnm envisions could request such verification, actually comprise an impeachment panel, the State of HI will not be satisfied that such request meets the exceptions to HI’s confidentiality laws. Like you, bob strauss, too, could not accept the fact that my opinion did not support his. jbjd,338-18 (g), it says, “shall not issue verification UNLESS”! the applicant seeking verification meets one, of 5 definitions, to qualify as a person allowed to obtain verification of what is on the docs. PLEASE read the definitions, 1 through 5, where it describes the people, who ARE ALLOWED to obtain verification. 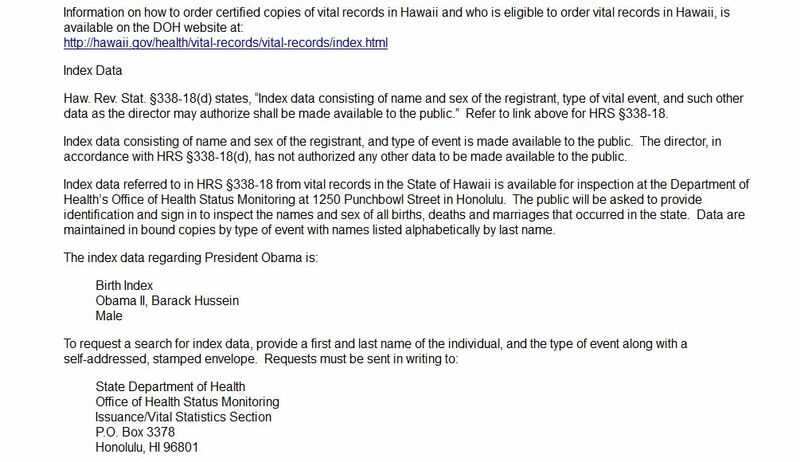 Sorry to keep bugging you about this but, it looks like Hawaii will verify records if you fit the description listed at 338-18g. 1-5.
bob strauss: No, you are not bugging me! I did read the law, completely, although the only part I thought mattered was that line I quoted, saying, “The department shall not issue a verification in lieu of a certified copy of any such record, or any part thereof, unless it is satisfied that the applicant requesting a verification is:…”. I understood this language to mean that, the discretion of the HI Health Department would rule; and this meant, they would exercise their discretion to maintain privacy. Because HI does not want the world to know that, for several decades, they were giving U.S. identities to foreign born babies. Remember, before it will place the name of the nominee for POTUS from the the major political party onto its general election ballot, HI is the only state that requires the party to not only Certify the name of its candidate but also Certify he is Constitutionally eligible for the job. (jbjd note 02.13.11: Of course, we now know, at least one other state, SC, also requires this explicit language of eligibility on its ballot application. IF IT LOOKS LIKE A DUCK…) I assume Hawaiians enacted this law because of that earlier law allowing foreign births. That is, they of all people know how easily someone who is not a NBC could be nominated for the job. But before I could post this Reply to Rlqretired’s ‘first’ Comment, he sent along this ‘second’ Comment. This time, my response, in orange, is inserted amidst his remarks. This comment is submitted while my previous comment is still in moderation along with your insult. Now, finally, one of these practitioners whose work I rejected, has posited that, perhaps the wild goose chase she sent her readers on, was based on a contrived premise. (That is, she suggests any ‘evidence’ of such announcements was intentionally ‘planted.’) Yet, judging by the references to her nom-de-plume throughout the blogosphere, thousands of people still follow her work. I gather from your insult that you are unwilling to accept my proposal that we simply agree to disagree on the value of the photographic evidence the Hawaiian State Seal on Obama’s one and only birth certificate is a fake. I reject your characterization that pointing you away from frivolous pursuits when pursuing the issue of candidate eligibility is an “insult.” These entreaties to get me to ascribe some value to work I deem valueless is all a waste of time. So, too, it would seem, were the years I spent showing people what went wrong in 2008 and trying to get them to focus on remediating what went wrong and then, on how to correct the system so as to prevent these wrongs from recurring in 2012. Sure, now, in 2011, some eligibility charlatans have begun to shift their focus away from judicial ‘Hail Mary’ filings and begun to focus on fixing the ‘system.’ However, efforts up to this point have left states no better positioned to avoid electoral disaster in 2012 than they were in 2008. In your response to an off blog email from me that mentioned another bloggers post on the use of 338-18 (g) about how lawyers in legal proceedings could use this part of the statute to obtain verification of specific questions about the birth certificate you wrote “ And, as usual, I completely disagree with her ‘legal’ analysis. I have previously de-bunked this specific ploy, and will gladly repeat my objections, on the blog.” If you insist on taking the legal advice of a self-described Graphic Artist/Designer then, why bother seeking advice from a self-described lawyer? Anyone, it seems, will do, as long as you share the opinion offered. If you will not look at 338-18 (g) and give me your opinion, which I desperately need, if (g) can be used as I have suggested, please fulfill your offer to debunk the idea as you said you would be glad to do. The last thing in the world I wish to do is to get into a senseless argument with you. I am only seeking a legal opinion for what I, as a lawman, see as a possible beneficial thing to do to get at the legally recognized truth about Obama’s and the DNC collusion. I have provided that opinion previously, as I stated. You just had to look for it. You might also remember that your efforts nor any other legal expert’s efforts have been successful as yet and if (g) can be used as I have suggested, it could possibly be a help to all of our efforts. Ah, the canard, ‘You have been unsuccessful, too.’ But I have not. Way back in the summer of 2008, I successfully identified the methodology that must be used to approach issues of Presidential eligibility. In short, almost 3 (three) years ago now, I pointed everyone to the states. But unlike almost every other blogger pursuing this topic, I never held myself out as a savior of the Republic. Rather, understanding that fixing our electoral process was the work of the citizens of the states, I merely provided the tools necessary for the citizenry to carry out their work (sans the hysteria and hyperbole). Ignoring the voluminous exchanges with readers via email, one need only peruse this blog to find ample evidence of my tangible contributions to my fellow citizens in this regard. Yet, having sacrificed my life to this endeavor and, endured unceasing slings and arrows on that account; I am still attacked for their failure to finish the job. Fortunately, I do not gauge the value of my work perfecting our electoral system, on the number of hits to the “jbjd” blog; or to the PayPal buttons; or to my psyche. If Barack Obama is not Constitutionally eligible to hold the office of President then, those members of the D party broke the law in 2008 who swore to state election officials he was, to get them to print his name on the ballot in those states that only print the names of candidates qualified for the job. Many people who believe he is ineligible advocate we should shore up state election laws to forestall another round of fraud in 2012. Meanwhile, others urge we should not let off the hook those members of the D party who fraudulently pulled off his election in 2008. The problem of establishing candidate eligibility for office can be rectified on two fronts. Those of you in states without existing ballot eligibility laws can focus on drafting smart candidate ballot eligibility laws for 2012. The rest of you can work to persuade your A’sG to enforce existing laws. In this way, that is, by concentrating on eliminating election fraud viz a viz the ballot using both prevention AND remediation, we can get at the problem of candidate eligibility coming AND going. All filers, old and new, make sure to read and understand the complaint before signing with real names and addresses, and sending. The Democratic National Committee Services Corporation, disguised as the DNC, installed Barack Obama into the Office of President of the United States of America by committing massive election fraud that played out uniquely during each of these 3 (three) phases of the 2008 Presidential election cycle in relation to the company’s August 2008 Presidential Nominating Convention: 1) pre-Convention; 2) Convention; and 3) post-Convention. The fraud committed both before and after the Convention has been dissected in several articles previously posted here on the “jbjd” blog. This four-part series entitled, “A Coup, Through and Through” analyzes the fraud pulled off at the Convention. Keep in mind, not all fraud is created equal. While the record establishes the D’s committed fraud throughout the general election cycle, my work has remained focused almost exclusively only on that fraudulent conduct which both 1) violated laws explicitly or implicitly proscribing such conduct; and 2) arguably altered the outcome of the 2008 Presidential (Electors) election. But given the several problems they knew were inherent to his candidacy, any one of which, if exposed, could prove fatal to his political aspirations, winning the nomination would require that they clinch the nomination as far as possible in advance of the DNC convention. In this way, they could limit the scope of the public examination of the candidate apt to occur in a protracted battle for the nomination. They were willing to do whatever it took to accumulate enough pledged delegates during the primary and caucus contests to reach the magic number that long before the convention would ensure at that time, he would be handed the nomination. Manufacture chaos at the caucuses and capitalize on the confusion created? Check. Collude with A.C.O.R.N.? Check. Censor critics with charges of racism? Check. Cultivate a compliant press willing to conceal stories unflattering to either the candidate’s character or, their own complicit conduct on the road to his nomination? Check and check. When the numbers for Hillary Clinton, his toughest competition in the race for the nomination, placed these two in a virtual dead heat with 3 (three) more months until the primary and caucus contests ended and 5 (five) months until the convention, co-opt the free will of the voters by spreading the meme she has already lost the nomination? Check. Co-opt the free will of the candidate by calling her a sore loser if she doesn’t drop out of the race now and throw her support(ers) to him, for the good of the party? Check. DNC rules provide if voting at the convention fails to support one candidate over the other then, special super delegates will add their votes to the totals to reach the number required for nomination. So they were also furiously pouring money into the PAC’s and war chests of these super delegates, in return for which the candidate received a public pledge of support positively correlated to the superior size of his financial investment. But even factoring in the votes of those super delegates already expressing support for Obama, with less than 3 (three) months to go before the convention he still had not achieved the superiority in delegates that would secure his nomination. And the delay had taken its costly and anticipated toll. Despite their best efforts to control the narrative, one of those ‘problems fatal to his political aspirations,’ known as Rev. Jeremiah Wright, had leaked out. And from the time the public learned of the long close relationship between the candidate and his avowed “spiritual adviser,” he had already lost more than 10 (ten) points in the polls. To understand what they did next, you need to know the difference between being designated a Clinton pledged delegate and an Obama pledged delegate. Attorney Bob Bauer, then counsel to the DNC and now WH Counsel, explains the delegate selection process to the federal court in DiMaio v. DNC, a case not material to the fraud laid out here. The DNC is the governing body of the Democratic Party of the United States and is responsible for promulgating delegate selection rules for the 2008 Democratic National Convention…The nominee of the Democratic Party for President of the United States is chosen by the delegates to the Democratic National Convention held in each presidential election year. The National Convention is organized and run by an arm of the DNC. The delegates from each state are chosen through a process adopted by the state’s Democratic Party. For each presidential election starting in 1976, the DNC has established formal Delegate Selection Rules to govern the selection, in each state, of its delegates to the National Convention. These rules require each State Democratic Party to develop a written delegate selection plan and to submit that plan to the DNC’s Rules and Bylaws Committee (“DNC RBC”) for review and approval. The delegate selection process in each state involves two basic functions: (1) the allocation of delegate positions among presidential candidates, i.e., how many delegates from that state will go to the Convention pledged to each candidate; and (2) the selection of the actual individuals to fill those positions, i.e., the selection of the people who will attend the Convention as delegates and alternates. Generally, state parties use either a primary or a caucus/convention system. In a primary system, the state party uses the state-government run or a party-run primary election to allocate delegate positions, and then a party-run meeting (caucus) to fill those positions. In a caucus system, the state party uses a series of party-run meetings — caucuses — both to allocate delegate positions and to select the persons to fill those positions. A caucus/convention system does not involve use of the state’s electoral machinery. Of the 56 states and territories that sent delegates to the 2008 Democratic National Convention, 20 used party run caucus/convention systems. In short, the numbers of votes a candidate receives in a party primary or caucus contest translates into so many pledged delegates awarded, based on the vote:delegate ratio concocted in advance by the party. When the contest is over, the state party meets to select which party faithful, pledging fealty to one candidate or the other, will fill the slot of pledged delegate for his or her preferred candidate and then cast a vote for that candidate at the national nominating convention. On May 31, the DNC RBC met to finalize their response to the dilemma presented by FL and MI. Legislatures in both states had moved up their primaries in contradiction to the calendar set by the DNC. As punishment, the DNC indicated it would not seat delegates from either state at the convention. (Accused of “pandering” to Iowa, Obama had pulled his name off the ballot in MI. Clinton did not. She won heavily in both states but, the DNC and their allies in the press not only did not count those pledged delegate numbers in her totals, they did not even credit her with receiving the number of popular votes.) DNC Chairman Howard Dean had said in March, he expected delegates were “eventually going to be seated in Florida and Michigan as soon as we get an agreement between the candidates on how to do that.” In the meantime, each state party had allocated pledged delegates based on the actual popular vote for the candidates whose names appeared on the ballot, including those delegates who filled the slots represented by the ‘name’ “Uncommitted,” a category that received 40% of the MI vote. The Committee, whose members were hand-picked by Chairman Dean, heard from both of the states involved, and from representatives of both of the candidates, and then made their decision. In FL, where both candidates appeared on the ballot, the Committee awarded delegates in accordance with the popular vote, but gave each delegate only half a vote at the convention. But desperate to bolster Obama’s sagging numbers, his allies on the Committee adopted this solution for MI. First, all delegates would be seated at the convention but with only half a vote each. Second, all votes that had been cast for “Uncommitted” were now deemed to have been cast for Obama; and delegates assigned based on votes cast for “Uncommitted” would be reassigned to delegates loyal to him. Third, 4 (four) of those pledged delegates already assigned to Clinton as the result of votes cast for her; would be taken away and re-gifted to him. On June 3, the primary / caucus season ended. Clinton suspended but did not end her campaign. Tomorrow? Whatever happened to “by July 1”? Why this sudden (and rather petulant) rush to memorialize Obama’s coronation? Probably because those pesky problems with his candidacy were about to derail his political aspirations. Designing a political ad campaign such as “Fight the Smears” ‘to be used only in case of emergency’ was one thing; but actually rolling it out was another. Because its success gambled on the truth of this one contemptuous statement: American voters are too stupid to know that there’s a difference between “natural born” and “native”; and that “Fight the Smears” is nothing more than a PAID POLITICAL ADVERTISEMENT, anyway. Understandably, the Obama team held back on the nuclear “Fight the Smears” option for as long as it could. Yet hard as everyone tried, Clinton just would not abandon the nomination. And why should she? Examining the traditional rubrics of success – total number of pledged delegates; popular votes; likelihood to beat the Republican in the general election – the two contenders remained within the ‘margin of error.’ Besides, neither Clinton nor Obama had amassed the requisite number of pledged delegates to wrap up the nomination on the first call of the roll on the floor of the convention. The Obama campaign launched “Fight the Smears” on June 12. Up until this point, the ‘dirty tricks’ carried out by operatives tied to the D Corporation to lie and cheat their man’s way into the D nomination were only sinister and underhanded. But, with the exception of the allocation of votes:delegates in Texas, technically, they were within the letter of the law. (LULAC v. Texas Democratic Party.) All that changed in the summer months leading up to the convention, when Obama and his champions and converts, now clawing at straws, conspired to literally steal the nomination. Which was a good thing for Obama emissaries who now fanned out across the country and harassed her delegates, in person and by wire, to get them to agree to switch their votes to him, before the convention. Twisting arms to ‘turn’ pledged delegates before the convention was not only not prohibited under DNC rules but also, in 37 (thirty-seven) states, it wasn’t against the law. As for the other 13 (thirteen) states, well, that was quite a different story. See, voters in 13 states – AZ, GA, IN, KY, MA, NH, NM, OH, OK, OR, TN, VA, and the delegate mother lode, CA – had enacted this special legislation. ‘In our state, pledged means PLEDGED. This means, delegates pledged to a candidate as the result of votes cast in the political party’s primary or caucus election; must vote for the candidate voters elected them to represent, at the party’s nominating convention.’ (I ‘discovered’ these states in the summer of 2008 and named them “vote binding states.”) In short, extorting Clinton pledged delegates in these 13 vote binding states to commit to switching their votes to Obama before the convention, was against the law. And they knew what they were doing was illegal. Being “related to the delegate selection process,” the state law that required pledged delegates to vote at the convention for the candidate voters elected them to represent was included in the delegate selection plan each of these 13 states had submitted to and was subsequently approved by the DNC RBC. In other words, Obama’s agents who began harassing Clinton pledged delegates from vote binding states to switch their votes to him, months before the convention, undoubtedly knew they were breaking the law. But desperate times called for desperate measures. WERE YOU LYING THEN or ARE YOU LYING NOW? Following, Speaker Pelosi administers the Oath to the other 433* members of the House. *The seat of Rahm Emanuel (D-IL), set to become the Chief of Staff of the incoming President, Barack Obama, was vacant. Id. On June 10, 2008 during the 2nd session of the 110th Congress, Mr. Kucinich stood up once again to introduce Articles of Impeachment, this time against President George W. Bush, charging he had deliberately lied to Congress by overstating the nuclear capability of Iran so as to propel the U.S. into war against that sovereign nation. Tragically, by Certifying votes of the Electors on January 8, 2009, two days after taking the Oath of Office; and by failing to exercise their Constitutional authority as to Impeachment since the January 20 Inauguration, Mr. Kucinich and other incumbent Representatives, along with their freshmen colleagues in the House have failed both individually and as a deliberative body to honor that Oath. And that failure derives not just on the basis they did not take affirmative steps to address the charges raised in the petitions submitted to them by their constituents that President (elect) Barack Obama appeared to be Constitutionally unqualified for the job; but also from the reasons they expressed to justify why taking such steps was not required. Did Representatives of the 1st session of the 111th Congress, including Speaker Pelosi, believe those words they swore when taking the Oath of Office back in January 2009, without any mental reservation or purpose of evasion? Did they believe at that time an electronic image of a redacted document posted on the campaign website of a candidate for the Democratic nomination for President at the behest of the Communications Director of the candidate’s campaign, which image is only accessible with the aid of a computer screen; is tantamount to evidence that the nominee wannabe is Constitutionally qualified for the job? Or did they knowingly offer ‘bones’ just to fob off their desperate constituents, thus violating both the spirit and the letter of the laws that put them in office? We might generously assume the 62 freshman legislators were so green when they took office that they didn’t know the difference between a paid political advertisement and a proffer of proof, notwithstanding 15 of them are lawyers. But can they have reached the second half of the 2nd session of the 111th Congress and still think these two are the same? Have they ignored ongoing correspondence from constituents documenting that members of the Democratic Party, including their Speaker, who signed these Certifications of Nomination in August 2008, have refused to identify any documents that were the basis for their determination Mr. Obama is a natural born citizen? Even in those several states in which the nominee for President of the major political party has to be qualified for that office before election officials are legally authorized to print his name on the ballot? Our Representatives told us in January 2009 according to ‘evidence’ they relied on, they believed Barack Obama was Constitutionally qualified for office. Notwithstanding we have since torn that evidence apart, they have not exercised their authority to seek more. In other words, they still believe the record establishes, he is a natural born citizen. Assuming, that is, they still believe in their Oath of Office. Because they still haven’t introduced Articles of Impeachment. WERE THEY LYING THEN OR ARE THEY LYING NOW? I want you to understand the solemnity this particular question holds. He had killed someone before he attacked me. And that wasn’t all. At the time, he was on parole from a multiple year sentence stemming from convictions on several counts of armed robbery. Police in my jurisdiction caught him 3 1/2 months after my attack. Having violated the terms of his parole, he would have to serve out the 6 or 7 years remaining on those prior convictions. But apparently anxious to avoid prosecution for the attack against me, he voluntarily gave sworn statements to both police and prosecutors, concocting a whole narrative which could exonerate him in this crime. Prosecutors in the other jurisdiction, charging 1st degree murder, were given first dibs. They figured, if they got a conviction on that charge, he would be sentenced to life without parole; and my case would never have to go to court. Only, he got a hung jury. In just a few years from now, he would be back out on the streets. I agreed to testify but, always mindful of his threats, hoped for a plea. We went to trial 1 1/2 years after the attack. I was sequestered until closing arguments, meaning I wasn’t allowed inside the courtroom during the trial except during my testimony. The District Attorney provided me with status reports during intermittent breaks in the proceedings. Then, it was my turn to testify. I had told the Victim/Witness Advocate, I hoped more women were seated on the jury, explaining I thought they would be more sympathetic. She said more men would be better because women tend to make themselves feel safe by rationalizing, ‘She must have done something to place herself in harm, which I would never do.’ Men would know this man was capable of doing harm. The jury was mixed. I took the stand to recount the attack only yards away from this man who had threatened my life if I talked. He cleaned up quite well. Indeed, given the fact his prior convictions and even his present place of residence were unknown to the jury, he made a good first impression. I completed my testimony after lunch, and the Defense Attorney briefly cross-examined. As I was about to leave the courtroom I learned, the Defendant would exercise his option to take the stand. The DA came out after finishing his cross-examination. The Defendant, trying to manipulate my testimony, had played it all wrong. The DA smiled. ‘While he was lying under oath, I realized, he must have forgotten about his earlier statements, which were in one those boxes I brought into court. So, as I began my cross-examination, I put a box up on the table. I took the testimony he gave today which contradicted his earlier statements, and restated his words in the form of a ‘yes’ or ‘no’ question. Then, after each answer, I turned around, reached into the box, and whipped out one of the earlier statements. ‘But I have here a sworn affidavit signed by you which contradicts what you just testified here under oath.’ “Were you lying then or are you lying now?” That’s when I began to feel safe again, knowing no matter how charming and handsome, he had lost all credibility with the jury. They were certain to convict and, no doubt, the judge would impose a multiple year sentence, to be served ‘on and after’ the terms of his present incarceration. In other words, for me, this question, ‘were you lying then or are you lying now,’ has somber connotations. Accordingly, I did not choose it casually for the title of this article; nor do I ask it lightly. But it is the only question that can be asked of and remains unanswered by all 435 members of Congress petitioned by their constituents to inquire formally into whether Barack Obama satisfies the Constitutional qualifications of the office of President. Including Madam Speaker, who refuses to respond to voters’ questions as to what was the documentary basis for swearing in that signed Certification of his Nomination that he is a natural born citizen. (See Citizens of Virginia Complaint of Election Fraud to AG Cuccinelli, in sidebar.) Because even though for 2 (two) years now, these federal legislators have been telling their constituents, they believe, he has satisfied a showing he is Constitutionally qualified for office; in fact, based on the overwhelming circumstantial evidence constituents have assembled even without their help; he has not. On November 2, 2010, all 435 seats in the U.S. House of Representatives will be up for election. Based on the failure of all our Representatives, now incumbents, to demonstrate they appreciate the solemn public trust inherent in their positions, as evidenced by their ongoing decision to ignore constituent petitions for an inquiry into the President’s Constitutional qualifications for office; why would we want any one of them back on the job? Each member of the House of Representatives will constructively forfeit the privilege of reelection by failing to introduce a Resolution of Impeachment before the November 2010 election. That is the only mechanism through which we can examine Mr. Obama’s role in the criminal conspiracy of fraud that got state election officials to print on the ballot the name of the candidate who overwhelming circumstantial evidence establishes is Constitutionally unqualified for the job. And, assuming the focused investigation and trial by the Senate validates our findings then, under the Constitution, Impeachment is the only way to remove him from office.